Bose became very well known a few decades back for their iconic 800-series speakers, which utilised the then-available technology in a different way to most of the competition (unusually, they required a dedicated processor to optimise performance), and more recently, the famous L1 system has been a well-received and much-copied approach to live amplification of single sources and smaller ensembles, producing remarkably consistent and even coverage. 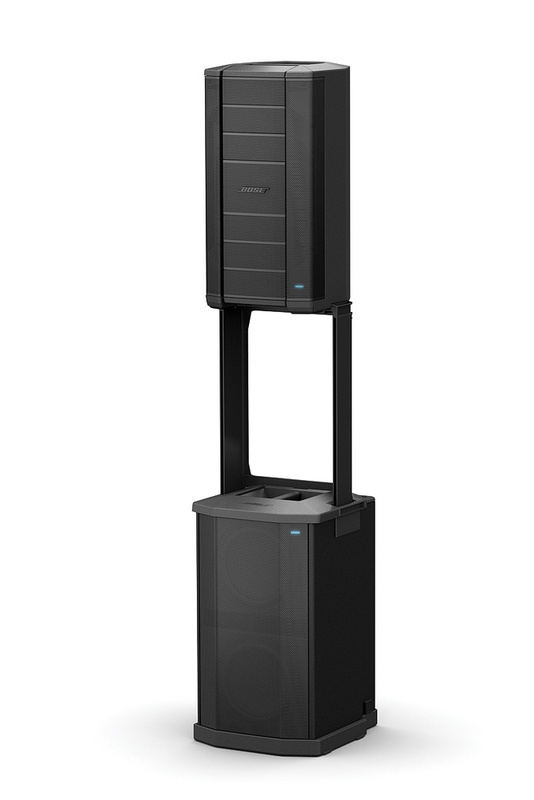 The company have recently introduced their innovative F1 system, which combines true line-array performance with familiar ‘black box’ portability and ease of use. The F1 has created quite a bit of chat, and I was fortunate enough to get hold of a full four-box system to see what it could do. Let’s start with a brief description of what the F1 system is, and take a look at the feature set along the way. The mid/high speaker is called the F1 Model 812; the model number indicates the driver format, which is the main difference between this and a conventional woofer/horn design. The 812 uses eight small mid/high drivers (just over two inches in diameter) to form a true line source, and these are backed up by a single 12-inch driver mounted directly behind them to take care of the lower end. The Model 812 is self-powered, with a 1kW-rated amplifier section on board, and the published specification relates a -3dB frequency response of 52Hz to 16kHz, a maximum peak output (at one metre) of 132dB SPL, and a coverage pattern which is 40 degrees vertical by 100 degrees horizontal (these dispersion angles apply to the HF output, as the lower frequencies become less directional the lower they go). 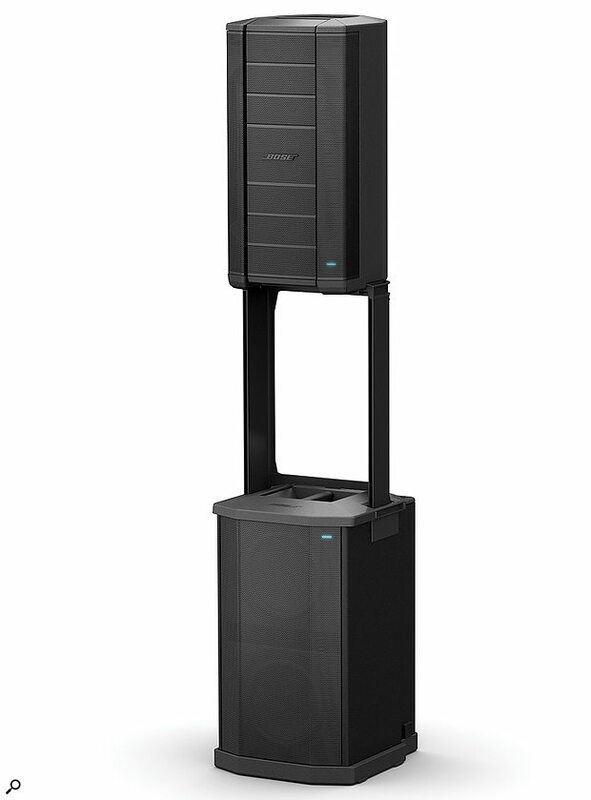 This makes it ideal for functions where the audience extends well to the sides of the sound source — for example, many corporate functions are held in wide conference venues where the usual solution is to deploy additional sets of conventional point-source speakers to reach the sides of the room. 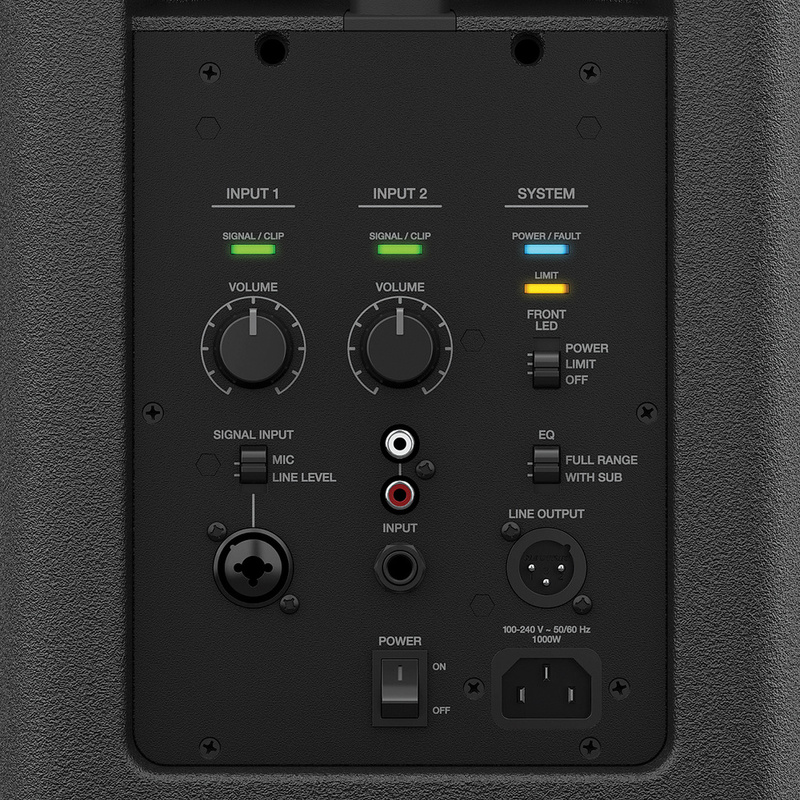 As if bringing real line-array performance into an easily rigged and truly portable package wasn’t enough, the F1 Model 812 has another major trick up its sleeve: its adjustable array pattern. This isn’t a complicated, electronically synthesized solution, but a simple and effective design which requires no technical input from the user. The top and bottom sections of the vertical array can be angled back to achieve any one of four different coverage patterns. By simply pushing the top or bottom part of the front grille, the upper and lower sections swing back and click into place, where they are held by magnets. The resulting pattern optimises coverage for different situations. For example, where the audience are below a high stage, you would angle the lower section down; where the PA is on the floor beneath raked seating you would tilt the top part back to extend coverage to the upper levels; and so on. The sections seem to hold in place very well, and the internal electronics sense the physical configuration and automatically apply appropriate EQ to shade the relevant array sections and maintain even balance. It’s that simple, it works — and it’s necessary, as the cutoff at the edge of the coverage can be quite sharp on this type of speaker. The Model 812’s basic input mixer means that it can work on its own, where only a microphone and some backing tracks need to be amplified. The F1 Model 812 speaker is a full-range unit on its own but, as with many of its type, can benefit enormously and have its capability extended by using it in conjunction with a suitable subwoofer to handle the low-frequency material. The F1 Subwoofer is the 812’s design mate, and not only provides a perfect match in audio and ergonomic terms but incorporates a very neat stand assembly for the 812 cabinet to sit on. The result is an extremely attractive and purposeful-looking rig. Although very much matched in style, the two enclosures are constructed of different materials; the 812 full-range unit is a moulded cabinet and the subwoofer is made from wood with composite caps top and bottom. 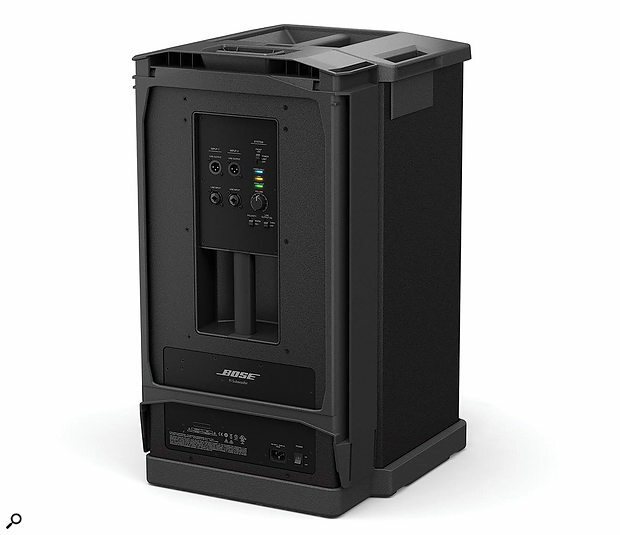 Technically, the F1 Subwoofer also contains a 1000W amp module and uses two 10-inch drivers in a very compact cabinet to produce a peak output of 130dB SPL, with good LF extension down to 40Hz at -3dB and 34Hz at -10dB. I’m one of those users to whom product appearance is important: years of feedback from my customers, most noticeably corporate ones, has often included comments on the way the sound system looked as well as the way it sounded. It’s obviously possible to engineer the sound in different ways, and achieve acceptable, good or great results if the kit is up to the job, but the one thing you can’t do much about is how it looks, and I think the Bose F1 looks great on any stage. I like the grille design, which seems strong enough to withstand a bit of road abuse, and allows the interested punter to peer through and get a glimpse of the goodies within. All things considered, though, I’d probably prefer a thin foam layer beneath the steel grille as a bit of extra protection against the odd bit of moisture. I am always interested in the ergonomics of portable speaker design, as so much of my own interaction with the product is when I’m carrying it, loading it into a van, or rigging/de-rigging on site. I also like to keep my sound gear in good physical condition both to protect my investment and to maintain its suitability for ‘posh’ gigs. The F1 boxes are easy to handle; the full-range 812 weighs just over 20kg (44.5 pounds in old money) and the F1 Subwoofer a shade under 25kg or 55lb, and I was able to move them around by myself without any difficulty, helped by the provision of good, well-placed handles on the top and rear panels. The F1 Model 812 full-range speakers do have pole sockets underneath (very nicely designed ones, with a large docking funnel) but the clever part is that the F1 Subwoofer has a stand clipped around the back, which simply pulls off and is inserted into two slots on the top of the sub. The 812 then snicks into place easily and securely to make a complete top-and-sub stack, which looks neat (the stand even has concealed cable channels to keep everything tidy) and takes up minimum floor space — certainly way less than a typical tripod stand. The stand on its own feels light and bendy, but once it is clipped in place there’s no flex in it, and all the integral bracing does its job perfectly. The only issue I had with the stack was that, when assembled, it’s not all that high — certainly not as high as I’d normally rig a tripod — and the upper cabinet is around head height, meaning that the whole thing would need to stand on something else (maybe the front of a stage?) to get the MF/HF section above any close-standing audience. Using the F1’s own stands means that there’s nothing extra to carry, the stack can be fully assembled in, literally, seconds, and it looks great. I had no problem lifting the 812 boxes off the stands either, but I did notice that someone — either the factory or a previous reviewer, perhaps — had seen fit to daub a large quantity of silicone grease all over the clip-together parts, which was both messy and annoying, and I doubt it was really necessary as the mouldings appear to be smooth and well designed. I first rigged up the complete F1 system in the studio and ran various test tracks through it. Listening to a line array up close doesn’t really work as the individual drivers need to work together to form a line source; however, from the other side of the room a few metres back, the sound was very crisp and clear, with a huge bottom end from the F1 subs. My initial thought was that this was capable of serious output level, and I really needed to get it out into a real live situation rather than messing around in a smallish space. As things worked out, I had an outdoor job that weekend which had always presented problems in terms of speaker choice. We were running the sound on two areas of a town carnival, namely the main arena (about 50-60 square metres of flat grass), and the music stage, where various acts would be performing throughout the day to varying audience numbers. The arena had always been difficult to specify, as the requirement was for a mixture of music coming from a ‘stage’ for dance groups and displays, and speech for announcements and commentaries, which needed to cover a greater area than the music. The speaker system had to be based on the grass, as there was no actual stage built other than a riser for speeches and presentations, and height was restricted because the rig had to remain under cover due to the weather conditions. I decided to use the F1 in the arena and see what it could do. Setting up was very quick, and although I was using an external mixer I could have just as easily plugged the radio mic and playback track straight into the 812’s inputs. For music playback I was concerned that the F1 Subwoofers would be struggling out in the open, especially as the dance tracks tended to be of the bass-heavy persuasion Need I have worried? Not at all — those compact subs produced levels of solid bass to please all of the performers and audience, and the recorded tracks sounded full and fat without exception. I did have the two F1 subs quite close together; after some experimentation with placement, and being tightly constrained by the shelter provided, I put the two F1 stacks a few feet apart and splayed them very wide to fire outwards across the arena. With both speech and music, I took some time to walk around the target area to listen for overlaps and null spots, and with a couple of very minor changes I achieved an even and well-balanced coverage for both music and the spoken material. As the mid/high units were just about level with the target audience. I had all four array sections pulled out into their straight-ahead position, and the output carried way beyond the edge of the arena and some way across the surrounding playing fields. Intelligibility remained very good throughout the audience area and the only gaps in coverage were due to objects in between. I would, of course, have preferred to raise the speakers and angle the lower part of the arrays down, but the results were great anyway and the organisers very pleased with the results. The F1 Subwoofer’s wooden enclosure houses two 10-inch woofers and 1000W of amplification, andowing it with a maximum SPL of 130dB and a frequency response that is only 3dB down at 40Hz. Packing up was just as speedy and painless as setting up, and I was getting to like the F1 speakers a lot by this time! For a second and contrasting test we took the F1 system out on a covers band function, where the venue was larger than their usual spaces and a PA upscale was called for. We set the F1 rig on the front of the stage (using the ‘J’ array shape), which resulted in ideal speaker height, and the F1 subs sounded perfectly happy with no additional tweaks needed. The even coverage was, again, a noticeable feature of the sound, with the F1 setup demonstrating that particular ability of arrays to fill the whole venue with sound and maintain clarity and balance across the whole area. The other remarkable quality they demonstrated was their output level. For such a compact system, the F1 rig can get very loud indeed! After these two gigs, I was left with the distinct feeling that this really is a portable live-sound system which would be good to go in almost any appropriately sized venue, indoors or out, with the possible exception of very small spaces where the listeners are right on top of the speakers. Despite trying to be careful with the speakers, in the absence of cases or covers, I noticed that the occasional and inevitable gentle scrape or bump didn’t leave any mark on the cabinet surface (I have moulded speakers which develop a rash when anyone looks at them), and whatever the material or outer finish is, it’s tough. My only concern on this front is that the control panels are not very deeply recessed, so the control knobs are exposed to potential heavy contact when the cabs are being lifted and carried, or when they are travelling alongside other gear — in the case of the F1 Model 812, the input level knobs do sit very slightly proud of the surrounding cabinet. So, after a short but enjoyable time in the company of the Bose F1 system, I have found something which (with apologies to Tolkien) might at last be approaching ‘one rig to rule them all’ territory. The sound of small line arrays isn’t to everyone’s taste, but this system will respond to a variety of driving styles, and for its size will deliver impressive results on a wide range of applications, including those where conventional point-source HF coverage just doesn’t cut it. 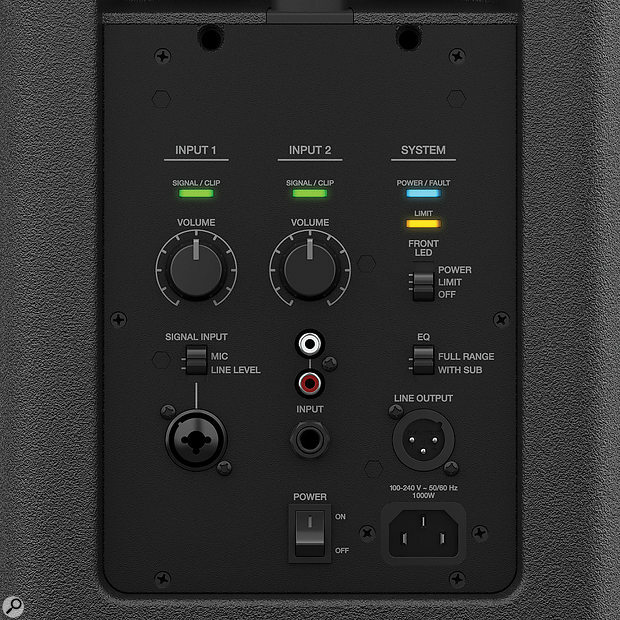 Its price makes the system affordable for anyone considering good-quality portable PA, and a route to ownership might be to invest in the Model 812 full-range speakers to begin with and use them with existing subs — something I have been thinking about since using this system. The quality, ease of use, and above all the flexibility of the F1 system is what has impressed me, and I think that this little rig would present a near-ideal solution to many of my live-sound requirements, right from corporate posh all the way to rock & roll. 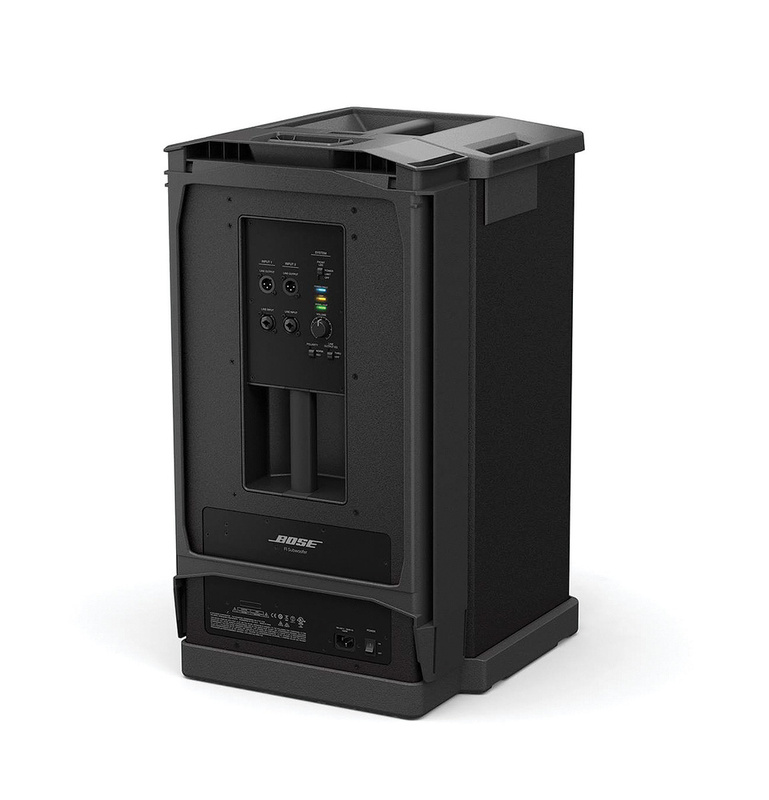 Once the preserve of arenas and festivals, line-array technology has been ‘trickling down’ into the semi-pro PA market for some years, with affordable and compact models now available from the likes of Fohhn, HK Audio and LD Systems, to name but a few. Line array delivers wide, even coverage. Extreme close-up audience won’t hear the full balance. Stand system is great, but not always high enough when floor-standing. Powerful, flexible and good-looking, the F1 system has a huge number of potential live-sound applications. F1 Model 812 £949, F1 Subwoofer £949. Prices are per speaker including VAT. F1 Model 812 $119.95, F1 Subwoofer $119.95. Prices are per speaker.